Malaysia‘s counterpart of the USCG, the Malaysia Maritime Enforcement Agency (MMEA), or APMM in Malay, was formed in 2005 and has approximately 7,000 members. Malaysia has an EEZ of 334,671 sq km, or about 3% of that of the US. In addition they have a substantial continental shelf of about the same size. The country itself is in two main parts, one on the Malay Peninsula and one part on the island of Barneo. It borders the busiest waterway in the world, the Straits of Malacca. They have recently begun to replace the vessels incorporated in the service when the agency was formed. It is in many ways similar to the Webber class in size and function. It is a FASSMER design. It is a little smaller (44.5 meters or 146 feet) and a little slower at 24 knots, but it is a bit better armed, having a 30mm gun and it has one trick we do not. It will have a small Unmanned Air System and associated launch and recovery system. The Malaysian Maritime Enforcement Agency has selected to the Fulmar UAV to equip their NGPC. The Fulmar is similar in most respects to the ScanEagle. 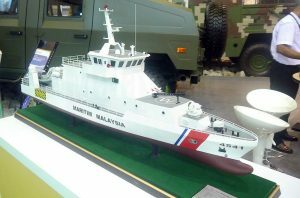 MalaysianDefence reports they expect to build three Offshore Patrol Vessels, at least 80 meters in length. The RM740 Million reported allocated equates to about $167M each . Reportedly the new OPVs will be a version of the Damen 1800 (ton) design (similar to those being built for South Africa, but with a conventional bow) 83 meters (272 feet) in length and 22 knots from 4×2350 kW diesels providing 12,600 HP. As part of their effort to build capacity among their neighbors, the Japanese are transfering two Japan Coast Guard cutters to the MMEA. The first of these, Erimo (PL-02) is, by USCG standards, still young, having entered service in 1991. She is 91.4 meters in length over all, 2,006 tons full load and capable of 20 knots with a crew of 38. The second ship wll be of the same class. This entry was posted in Asia, Cutter x, South China Sea, UAS, UAV, WPC by Chuck Hill. Bookmark the permalink. 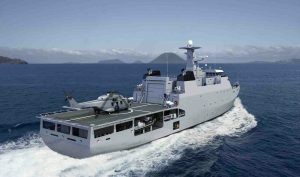 Quoting the German Navy blog, “Marine Forum”, “MALAYSIA, A Malaysian shipbuilding joint venture has laid down the keel for the first of three 83-m offshore patrol vessel to be built for the Malaysia Maritime Enforcement Agency (MMEA) … deliveries from 2020. Sounds like it will be in the water before the first OPC.